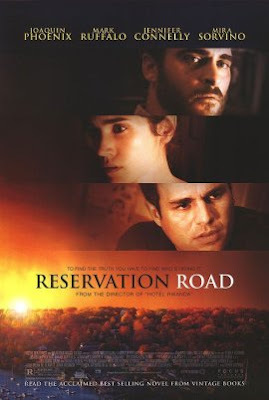 I’m not a huge Brett Ratner fan, but of all his movies this is probably my favorite. 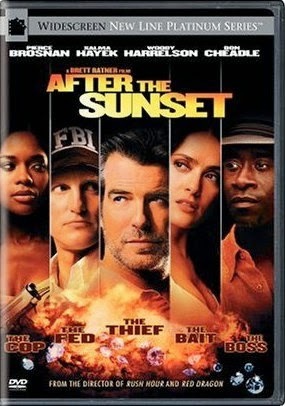 I like heist flicks and After the Sunset is a good, though not great, one. 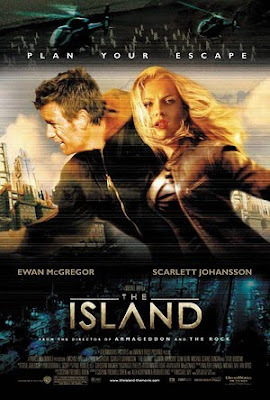 Brosnan’s charm, Harrelson’s wackiness, and Hayek’s beauty make this an enjoyable little film. Max (Pierce Brosnan) and Lola (Salma Hayek) pull their last heist in Los Angeles stealing the second Napoleon diamond from FBI Agent Stan Lloyd (Woody Harrelson) before retiring to the Bahamas. On arrival Lola is content with retirement, but Max grows bored. His boredom comes to an end when Stan shows up telling him that the third Napoleon diamond is on it’s way to the Bahamas and dares him to try and steal it. 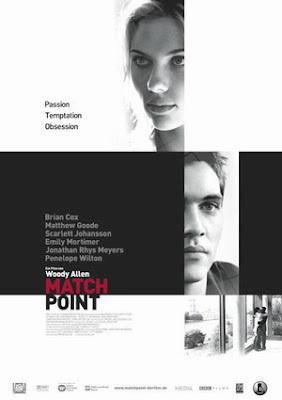 Max is in a quandary as Lola wants nothing more than to be married and leave their criminal past in, well, the past. Also involved is a local gangster Henri Moore (Don Cheadle) who wants Max to steal the diamond to help him pay for his gun running, prostitution, and drug business. The story starts with Mrs. Pevensie (Judy McIntosh) sending her four children to stay with Professor Kirke (Jim Broadbent). I assume the professor is a family friend or at least a nice stranger, but while the film explains why the mother would send her children away to protect them it never really clarifies why she would send them to Kirke. Exploring the pristinely clean house during a game of hide and seek the youngest of the clan Lucy (Georgie Henley) discovers a wardrobe (large dresser) in one of the countless rooms in the professor’s well kept mansion. Sorry, I have to stop for a moment. The movie is spotless; there is no dust, no dirt, no hair out of place. The Death Star wasn’t this clean! It may be nitpicking, but especially in a movie where kids hide in dusty rooms, roll around in the wilderness and fight to the death you might expect them to get a little mussed. Back to the story… See these four “children of Adam” enter the world of Narnia through the wardrobe (don’t ask how or why, or how the professor came into possession of the magical wardrobe. The film isn’t that well thought out. For example where do all these perfectly tailored children’s clothes keep coming from in a world without humans? Anyway, after 45 minutes of story they finally find themselves in a snowy forest and encounter all kinds of shocking sights. Well, I would assume they would be shocking, but these kids take it in like it’s something that happens to them everyday. True there is some shock when they meet Mr. Beaver (Ray Winstone), but the rest of the “wonders” of Narnia are taken completely in stride by the Pevensie crew. I don’t know what would happen if I met a talking lion or an army of centaurs, but I’m guessing I would react more than if I had met three old ladies crossing the street. Our visitors become instantly popular. It seems Narnia has talking lions and beavers, evil witches, trolls, centaurs, minotaurs, unicorns, but no humans. Narnia has been plunged into eternal winter that only pre-told coming of for humans can reverse. So these four untrained and somewhat unwilling children are given command of the armies of Narnia and Peter (William Mosley) is asked to lead them into battle. Good plan; who put the lion in charge anyway? 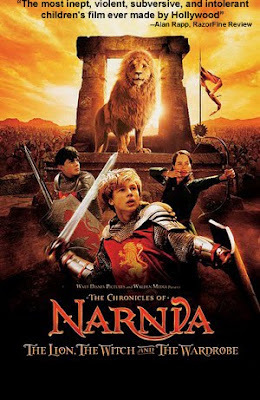 Subplots include the seduction of Edmund (Skandar Keynes) by the White Witch, the fate of Lucy’s friend, a faun named Mr. Thomnus (James McAvoy), and the brutal and torturous death of the lion general Aslan (Liam Neeson), which good sister Susan (Anna Poppelwell) allows her 6 year-old sister to witness (as to what other use Susan has in the story, well….I’m still trying to figure that out). Of course since no one dies in this movie I guess that makes the torture in front of children okay. We are made to watch his eventual miraculous resurrection, and if you can’t figure out the clumsy symbolism of this you need to ride the special bus to school. The scene is so heavy-handed and graceless all I could do was groan. The cavalier way this film deals with death makes me incredibly angry. The film puts children in control of an army allowing them to kill and yet never shows a moment of shame or contemplation for their actions. Nor is any blood spilled during this great climatic war. In fact the film’s main message seems to be war is good and there are never any consequences. I bet George Bush will love it. All but two of the characters the family meet in Narnia are CGI. Mr. Thomnus is the first character we meet through Lucy’s eyes. McAvoy is fine in the part though the look of the character, a faun, is never quite right. 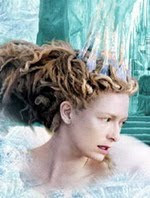 The other, the White Witch (Tilda Swinton in a waaaay over the top performance), is evil and devious, but only in a 3rd grade kinda way. You expect her at anytime to sneer and cry for her mommy. Truthfully it was hard to take her character seriously when she’s walking around for most of the movie with the Fortress of Solitude on her head. Creepy? Maybe, but not too scary. As for the human characters, the acting is what you would expect in a film that contains only child actors talking at bluescreens. The awkwardness of it made me nostalgic for Jar Jar Binks. It’s not that the performances of the actors are bad, though they are pretty bad. And it’s not that the characters are thinly written, though they are. It’s the way the story makes these four children carry the entire movie, an overweight and gargantuan charge, that sets them up to fail. It feels way too much like a rushed “TV event” rather than a large big budget theatrical production. The special effects are an odd bag as so many shots were needed (about 75% of this film is CGI) that multiple companies were hired. Some of the effects work well. Most do not. The blue screen scenes look amatuerish and you can often easily tell when the actors are in the studio versus at a location. This might make a fun drinking game but doesn’t really help the movie. It almost seems that the film was rushed into production as many of the larger or more complex shots seem unfinished and blurry as if only partially finished. Geroge Lucas should get ILM’s name of this film before it does his company irrevocable damage. The story might work well in a book but the movie takes any subtlety of the Christian allegory and rather crudely screams it at the top of its lungs. You might have well just named the lion Jesus for Christ’s sake! I also have some problem with the Christian theme being so heavy in the movie and casting every character who believes something different as a sub-human monster. Nice lesson or religious intolerance for kids there guys. The film also states the mind-blowing assertion that no matter how ill-equipped or badly led your army is as long as you have God on your side you will be victorious over infidels. Wow, a movie that pushes the ideals of Christianity and Al Qaeda! I wish somebody would have shot me halfway through this mess, but of course I wouldn’t have really died because I would be resurrected and forced to watch more. Sadly I had to settle for dying a little inside. It’s quite a shame that a film with this much money and press behind it seems so cheaply and so poorly made. Other than making Willow look awesome by comparison the film achieves little in its 140 minute running time. Lately though he’s begun to have nightmares about a life that isn’t his own, to question his existence, and that of the island as well. Finally his fears and suspicions get the best of him and he talks his best friend Jordan Two Delta (Scarlett Johansson) into escaping only to discover a world much different from what they believed existed. They are shocked to discover that their home is a cloning facility and they are clones and very valuable property. Lincoln and Jordan struggle through the real world as they hide from those that want them captured led by the imposing figure of Albert Laurent (Djimon Hounsou). 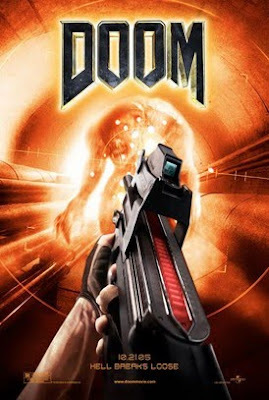 The film introduces several ideas: that all humans are corruptible and will do anything to survive, you shouldn’t trust your doctors, the police, or the government, and that human cloning, whenever it is achieved, will cause some severe ethical dilemmas. Not all the questions are adequately addressed or solved, but the issues are at least raised and discussed. The first third of the movie involves life in the facility, how these clones are made and the lives, and deaths, they are given. After Lincoln and Jordan’s escape the movie moves into full gear as a fast paced chase flick that never really slows down. Both halves of the movie work for me. Johansson is wonderful as she captures the intelligence yet innocence of her character who has grown up in a society that is ignorant of common everyday human activities. McGregor has the harder role as the clone who questions the lies and discovers the truth, but does an admirable job by keeping the action rolling. Steve Buscemi, a lab tech who befriends Lincoln, and Sean Bean, as the facility’s administrator, are perfectly cast in roles that they are known for, sarcastic comic relief and greedy villain respectively. In many places the film feels like an updated version of Logan’s Run, but better casting and special effects than the original. There are story points and gaps that may bother you after the movie. Isn’t their escape rather easy? What happens if someone wants two clones of himself made? How exactly does the mind/behavior modification work? Is there no opposition to the practice of cloning? Even with these issues unresolved we get two hours of action mixed with serious moral issues which turns out to be a nice midsummer surprise. While it wasn’t the sophisticated science fiction movie I wanted, it was a great summer action/adventure flick that keeps on entertaining. Even though it doesn’t succeed on all fronts, it does enough right that I would recommend it. Sure there are plot points that still bother me, but the movie is so much fun that is was easy to overlook them and just enjoy the ride. I would have preferred a more serious in-depth look at the ethical questions the film raises, but under the direction of Michael Bay (much better at explosions than philosophy) this was probably the way to go. Finally, if anyone who knows where I can actually get a clone of Scarlett Johansson let me know! !